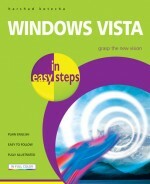 Windows Vista in easy steps provides a full color, clear and concise introduction to Windows Vista, the latest version of Microsoft Windows and successor to Windows XP. It covers the five different editions of Windows Vista (Business, Enterprise, Home Premium, Home Basic and Ultimate) helping you to understand which version of Windows Vista is right for you. It introduces you to the key features of Windows Vista, and explores its operations, including starting up, basic control functions, working with applications, managing files and folders, printing and fonts, networking and Internet. It reviews the new Windows Vista interface, including Windows Aero, security features and Windows Mail, and discusses system activation and validation, backup and Windows Update. This book will help you quickly become productive with your Windows Vista system, whether you are upgrading from an earlier version of Windows, or this is your first experience with Windows.